Nairns are best known for their delicious range of oatcakes. But they also make oat biscuits and oat crackers. 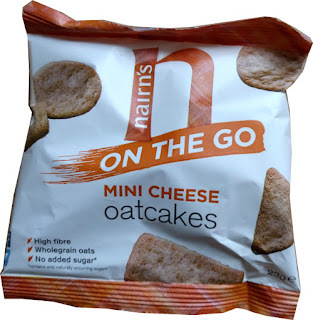 I recently discovered a new addition to their expanding collection – Nairn’s On The Go Mini Cheese Oatcakes. 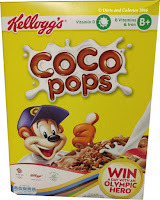 Any food that has a ‘mini’ version gets my attention as it usually means mini calories too! Nairns On The Go Mini Cheese Oatcakes can be found in a box with 5 bags of mini oatcakes. Each bag is worth 110 calories. To say I’m a snacker is an understatement. My desk drawer is heaving with bags of snacks! Mostly they’re Garbanzo’s Chickpea snacks as they take ages to crunch through and have only 88 calories a bag. I also have a few boxes of my absolute favourite Multiseed, Foods of Athenry sodabread toasts which have just 11 calories each. 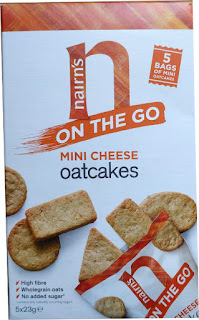 Now added to the stockpile are Nairn’s Mini Cheese Oatcakes. Each bag contains 11 mini oatcakes of mixed shapes. Each mini oatcake has around 10 calories. Although I don’t usually enjoy cheese flavoured biscuits, these are very nice and the cheese isn’t too strong. 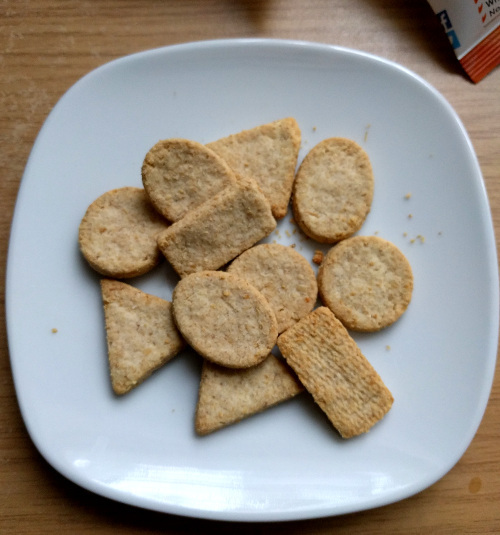 They have a crumbly, chewy consistency, similar to a shortbread biscuit and each mini oatcake is slightly thicker than a £1 coin. They are more substantial than a regular packet of crisps and I find that eating around 4-5 at a time is enough to satisfy my snacking urge. 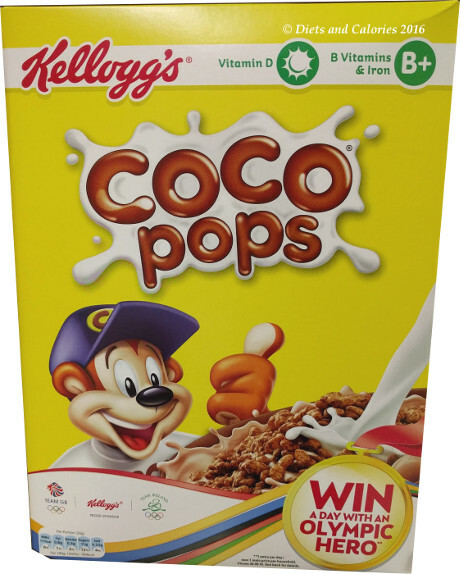 Nutritionally, they’re low in sugar so handy if you’re on a low GL diet and they contain a reasonable amount of protein per bag. But they are high in fat, saturated fat and salt! This is where portion control is helpful because each bag only contains 23g. Therefore, if you’re on a low salt, low fat or low calorie diet, then it is still possible to include one of these packs as the nutritional values are all clearly labelled on the bag. Just include the nutrition values in your overall daily count. You can find Nairn’s On The Go Mini Cheese Oatcakes in larger Sainsbury’s stores and some independent health stores. 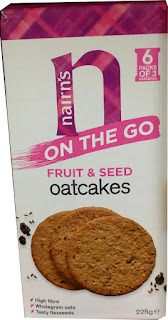 Also check out Nairn's on the go Fruit & Seed Oatcakes with 6 packs of 3 oatcakes. Nutrition per 23g bag: 110 Calories, 5.6g fat, 2.4g saturated fat, 11.1g carbs, 0.2g sugars, 1.7g fibre,3.0g protein, 0.60g salt. 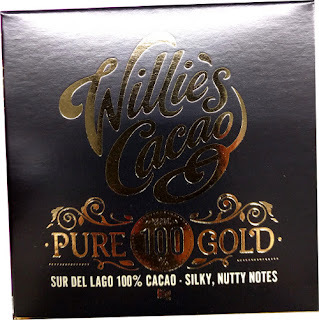 Phosphorous 72mg, Manganese 0.6mg. Ingredients: Wholegrain oats, (78%), cheese (14%) (milk), sustainable palm fruit oil, sea salt, raising agent: sodium bicarbonate.